VERY FINE AND RARE. ONLY A HANDFUL OF INTACT EXAMPLES OF THESE RE-USE PREVENTION ESSAYS ARE RECORDED. 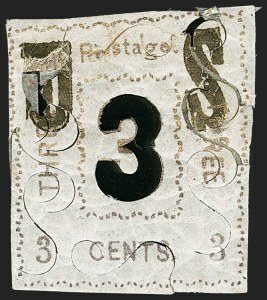 Unknown Author, 2c Bronze & Violet, "U.S. Postage" Re-Use Prevention Essay (79-E2b). 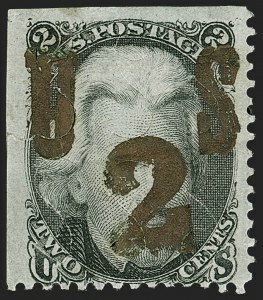 U.S. 10mm high, original gum, h.r., couple punch outs below bronze "U.S", small tear at upper right, Very Fine appearance and rare, unlike some other essays of this type which are folded designs, this re-use essay was pierced with "S"-shaped cuts, with the numeral cut out, this made the stamp fragile, preventing its reuse, ex Finkelburg and "Lake Shore", with 2005 P.F. certificate. VERY FINE. 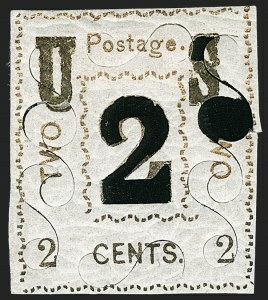 THIS 2-CENT BLACK JACK ESSAY IS THE ONLY EXAMPLE RECORDED IN PRIVATE HANDS. AN OUTSTANDING SHOWPIECE FOR THE CLASSIC AND BLACK JACK STAMP COLLECTOR. 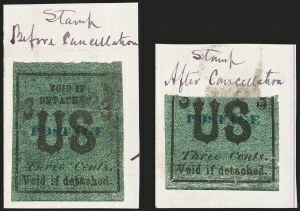 The "S" slits and gold overprint on this essay are similar to the those on the "U.S. Postage" prevention re-use essays offered in this sale (79-E1-E2, E4, E6). 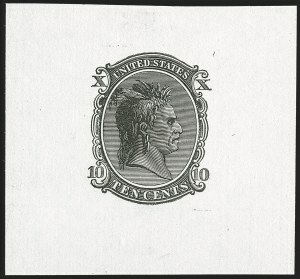 The slits and the fugitive ink overprint were designed to make the stamp impossible to lift or soak from a cover for re-use. Scott lists these as "author unknown" but they share similarities with essay material associated with George Bowlsby (under Patent no. 51,782). 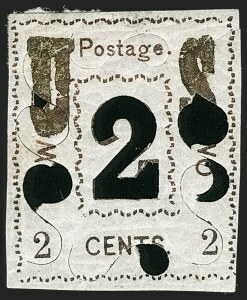 This particular item was long on the wish-list of several prominent Black Jack collectors. This is a wonderful opportunity for the newer Black Jack collector. VERY FINE. THIS PAIR OF 1867-68 RE-USE PREVENTION ESSAYS, WHICH SHARE SIMILARITIES TO THE BOWLSBY PATENT, ARE BELIEVED TO BE UNIQUE. 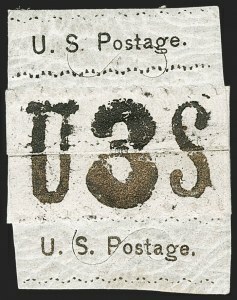 The Bowlsby patent for stamp reuse prevention (no. 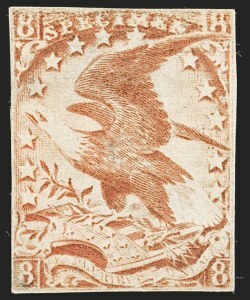 51,782) called for only a portion of a stamp to be gummed. 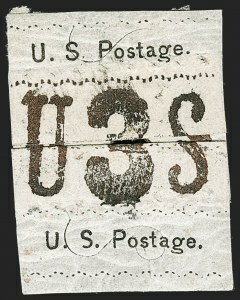 After being affixed to an envelope the ungummed portion was to be removed, thus preventing reuse of either piece once separated. The essay offered here is not directly linked to Bowlsby, but very possibly represents an interpretation of his patent tried by NBNCo., similar to the other "unknown author" essays in this section (79-E1 thru 79-E6). This ties particularly to lot 190, the Black Jack essay.